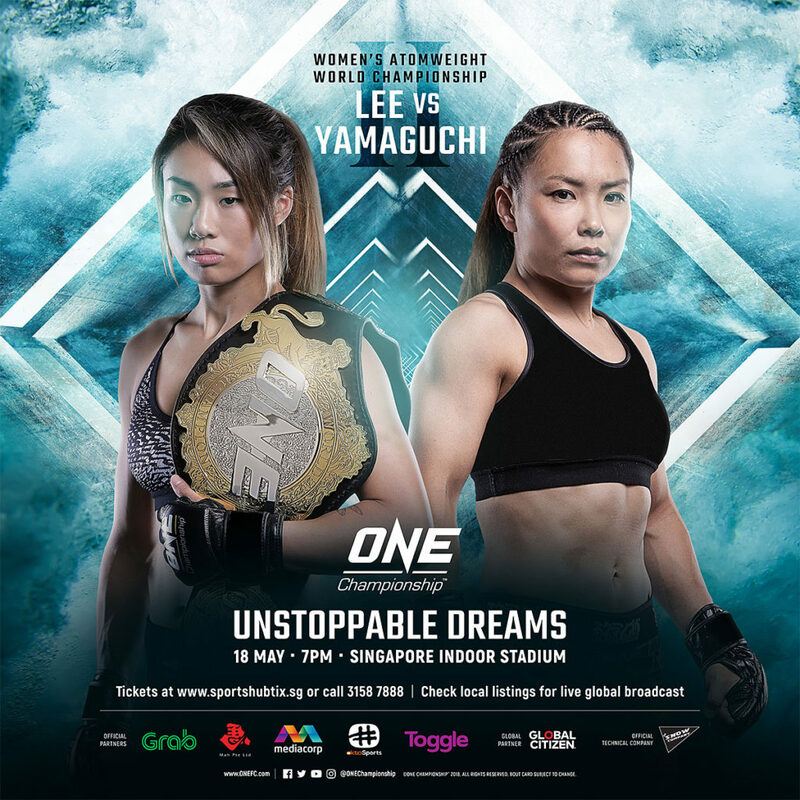 11 April 2018 – Singapore: The largest global sports media property in Asian history, ONE Championship™ (ONE), has just announced the complete card for ONE: UNSTOPPABLE DREAMS, set for 18 May at the Singapore Indoor Stadium. The absolute best in local and international martial arts talent are ready to showcase their incredible skills on the largest global platform of martial arts competition. In the main event, reigning ONE Women’s Atomweight World Champion “Unstoppable” Angela Lee makes her highly-anticipated return to action to defend her title against Japanese veteran Mei “V.V” Yamaguchi in a rematch. 34-year-old Sam-A Gaiyanghadao is a Muay Thai legend and multiple-time Lumpinee Stadium world champion who is regarded as one of the best strikers in the world. As a Muay Thai practitioner, Sam-A owns a record of 364-46-9, and was known for his strong defense and counter offense. An instructor at Evolve in Singapore and a member of the prestigious Evolve Fight Team, Sam-A made his first ONE Championship appearance last January against Joseph Lasiri in the first-ever Muay Thai bout inside the ONE Championship cage. Sam-A is set to lock horns with Sergio Wielzen, whom he will compete against for the inaugural ONE Super Series Muay Thai Flyweight World Championship. Lion Fight Muay Thai World Lightweight Champion, Sergio “Little One” Wielzen of Suriname is a Dutch-based martial artist training out of Amsterdam, The Netherlands. With a professional kickboxing record of 45-18-2, Wielzen has built a reputation as being an explosive striker with stunning knockout power. Despite being physically smaller than most of his opponents, Wielzen has won many of his bouts by knockout. He is also a former It’s Showtime 61MAX world champion. Wielzen is set to make his ONE Super Series debut opposite Muay Thai legend Sam-A Gaiyanghadao. 29-year-old Martin “The Situ-Asian” Nguyen is one of the most highly-regarded martial arts champions in the world. With an impressive 10-2 professional record, which includes three submissions and seven knockouts, Nguyen’s all-around skill set allows him to perform at the highest level of competition. All of Nguyen’s wins have come by exciting finish. Last November, Nguyen scored a scintillating knockout victory over the Philippines’ Eduard Folayang to become the first man in the history of ONE Championship to hold two titles simultaneously in different weight divisions, reigning as both ONE Featherweight & Lightweight World Champion. In his last bout, Nguyen figured in a historic showdown with ONE Bantamweight World Champion Bibiano Fernandes in Bangkok. Nguyen now makes a quick turnaround however, jumping right back into action as he defends his featherweight title against Christian Lee. 19-year-old Christian “The Warrior” Lee, younger brother of reigning ONE Women’s Atomweight World Champion “Unstoppable” Angela Lee, began his professional career on an absolute tear, railing off five straight victories by thrilling finish. He has impressed fans with his ability to seek out stoppage wins over top-caliber opponents featuring an exciting fan-friendly style. A former Pankration World Champion, Lee toppled Japanese veteran Kazunori Yokota in his most recent bout, winning via second-round guillotine choke to improve his record to 9-1. Riding an impressive four-bout winning streak with all four wins coming by finish, Lee is set to showcase his skills once more inside the ONE Championship cage. In his next bout, Lee has the chance to become a world champion when he challenges Martin Nguyen, the only man to ever defeat him, for the ONE Featherweight World Championship. 32-year-old Yodsanklai Fairtex is one of the most recognizable names in the world of Muay Thai. Known by the moniker “The Boxing Computer” as a testament to his impeccable in-ring techniques, he has won numerous championships in his stellar kickboxing career, including the WBC Super Welterweight Muay Thai World Championship and the coveted Lumpinee Stadium World Championship. Yodsanklai will face Chris Ngimbi in his ONE Super Series debut. Chris “The African Warrior” Ngimbi is a Congolese-Dutch kickboxer who hails from Eindhoven, Netherlands. Having nearly 70 bouts under his belt, Ngimbi has a long list of international accolades as a competitor. He looks to bolster his glowing repertoire as a global kickboxing superstar, as he battles Muay Thai legend Yodsanklai Fairtex in ONE Super Series. Global martial arts veteran Shinya “Tobikan Judan” Aoki of Shizuoka, Japan, is one of the world’s most decorated athletes. He is a DREAM Lightweight Champion, Shooto Welterweight Champion, and former ONE Lightweight World Champion. The 34-year-old Aoki is a Brazilian jiu-jitsu black belt under the famed Yuki Nakai, and has won multiple grappling tournaments all over the world. Aoki also holds a black belt in judo and is widely considered one of the best pure grapplers in professional martial arts competition today. In his next bout, Aoki looks to regain his status among the promotion’s top lightweights as he takes on Rasul Yakhyaev. 26-year-old Rasul Yakhyaev of Grozny, Russia, is a lightweight competitor who has racked up a solid following over his seven-year professional career. A jiu-jitsu and combat sambo practitioner, he is adept in both striking and mat techniques, and is considered a solid contender with tremendous combat skills. A well-rounded warrior, four of Yakhyaev’s victories have come by submission while three have come by knockout. After establishing a name for himself in Eastern Europe, he made his ONE Championship debut in December of 2015. In his most recent contest, Yakhyaev defeated highly-regarded lightweight Shannon Wiratchai by unanimous decision. He now seeks to take his career to the next level against former world champion Shinya Aoki. Former ONE Lightweight World Champion Eduard “Landslide” Folayang of the legendary Team Lakay in Baguio City is one of the Philippines’ most experienced martial artists. After nearly a decade of competing in various promotions, Folayang has amassed an impressive 18-6 professional record. The 34-year-old veteran has reinvented himself by transitioning from a pure striker to an all-around martial artist, showcasing a highly-improved wrestling and grappling arsenal. Now set to return to the ONE Championship cage in Singapore, Folayang will face Kharun Atlangeriev with the intention of putting himself back in the world title picture. 25-year-old Kharun “Predator” Atlangeriev of Russia is an unbeaten martial artist with a perfect 11-0 record. Atlangeriev has gone the distance just once in his professional stint, as ten of his 11 career wins have come by way of finish. He eyes to make an impact in his ONE Championship debut by defeating a former world titleholder in Eduard Folayang. 23-year-old Singaporean top lightweight contender Amir Khan is a martial artist with a stellar professional record of 9-3. He is considered one of the most promising young talents to represent Singapore on the global stage of martial arts. Khan has won an impressive six of his last seven bouts, and owns eight spectacular finishes on his resume. A certified action star, Khan’s record includes one win by submission and seven devastating knockouts. Next in line for Khan is newcomer Sung Jong Lee. Sung Jong Lee of Cheonan, South Korea, is a 32-year-old martial artist set to compete in the talented lightweight division of ONE Championship. Lee holds a professional record of four wins and one loss. Always looking to finish on the mat, Lee is a dangerous grappler who is capable of ending matches in a variety of ways. Lee steps inside the ONE Championship cage for the first time at ONE: UNSTOPPABLE DREAMS as he is set to face Singaporean hometown hero Amir Khan. Singtongnoi Por Telakun is one of the most popular Muay Thai practitioners in Thailand, winning numerous prestigious titles throughout his celebrated career, such as the Lumpinee Muay Thai World Championship and WMC Muay Thai World Championship. Famous for his relentless style in the ring, Singtongnoi has beaten some of Thailand’s biggest Muay Thai superstars. Singtongnoi will make his ONE Super Series debut opposite Joseph Lasiri. A product of the flourishing Muay Thai scene in Milan, Italy, 26-year-old Joseph Lasiri has become one of Europe’s most well-respected kickboxing competitors. Under the tutelage of Diego Calzolari, the first Italian to ever win at the world-famous Rajadamnern Stadium in Bangkok, he captured the WBA Super Bantamweight and interim WBC Super Bantamweight Muay Thai World Championships. Lasiri made his first ONE Championship appearance last January against multi-division Lumpinee World Champion Sam-A Gaiyanghadao in the first-ever Muay Thai bout inside the ONE Championship cage. In his next outing, Lasiri seeks to redeem himself as he takes on Thailand’s Singtongnoi Por Telakun in ONE Super Series. Huang Shi Hao of Singapore is a 25-year-old martial artist set to compete in ONE Championship’s stacked bantamweight division. A decorated Brazilian jiu-jitsu practitioner, Huang hones his skills to be a complete martial artist at the Singapore BJJ gym. After dominating the amateur ranks with his exquisite talent, Shi Hao fully realizes his dream to be a professional athlete, as he is scheduled to make his ONE Championship debut against China’s Xie Bin. 20-year-old Xie Bin of China is one of the most talented young fighters to come out of Tianjin. He started off his martial arts career with a victory over compatriot Ma Shuang at ONE: DYNASTY OF CHAMPIONS and has since put on several thrilling shows as a professional. In his last bout, Xie submitted Cambodia’s Chan Rothana with an impressive second-round Brabo choke. He is currently riding a two-bout winning streak and will look to push it to three when he takes on Huang Shi Hao. Indonesian martial arts veteran “The Terminator” Sunoto is a ONE Championship bantamweight and a former WKF Indonesia Champion. Representing IndoGym and Team Phantom, Sunoto features a style that combines elements of kickboxing, karate, and jiu-jitsu. With a penchant for scoring spectacular finishes, five of Sunoto’s eight victories have ended before the final bell. The 33-year-old is known as an aggressive warrior who never backs down from a challenge. In his last outing, Sunoto continued to impress on the global stage, defeating Hisyam Samsudin by unanimous decision. His next bout will be against Roel Rosauro of the Philippines. 29-year-old Roel “Akiyama” Rosauro of Cebu City, Philippines, is a Filipino martial arts prospect who trains in the art of Yaw-Yan. A striking specialist, Rosauro is known for his powerful hands and lightning-quick punches. Rosauro made his promotional debut at ONE: QUEST FOR GOLD opposite China’s Li Kai Wen, joining a growing list of promising talents in ONE Championship. He now returns to action as a bantamweight, seeking victory against Indonesian martial arts veteran Sunoto.